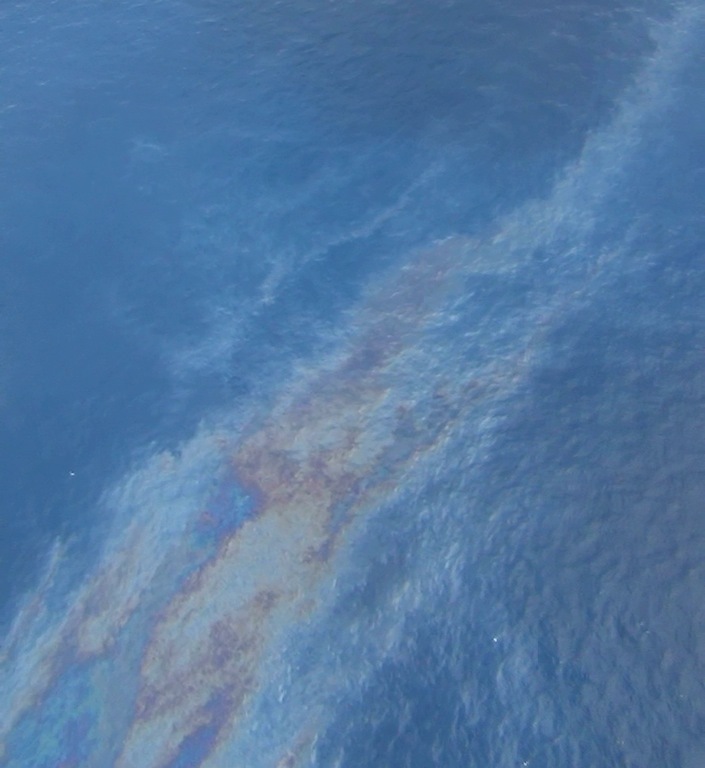 Our flight log gives more detailed info on the appearance and positions of the oil we saw; it is appended below the photo galleries. Our GPS tracks can be downloaded here; those will tell you exactly where we were at any given time. Finally, a good while later and about 160 nm still farther southwest, in Green Canyon, we checked out other known abundant natural seeps, most famously the one located in "GC600." 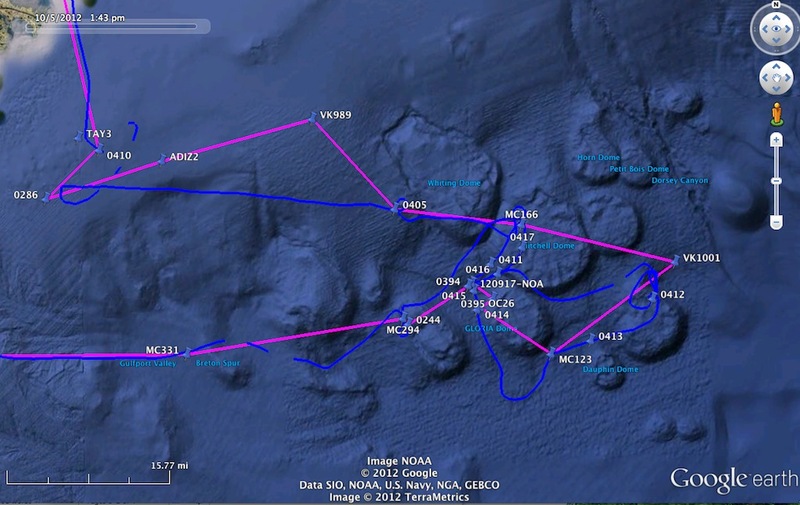 You will note from the flight log that we saw a lot of oil -- about 24 distinct sightings. We don't have photos of it all, but we do have many more photos than are shown here, and over the next week or so, we'll post the remaining photos of the additional slicks. Here are more photos from Oct 05. 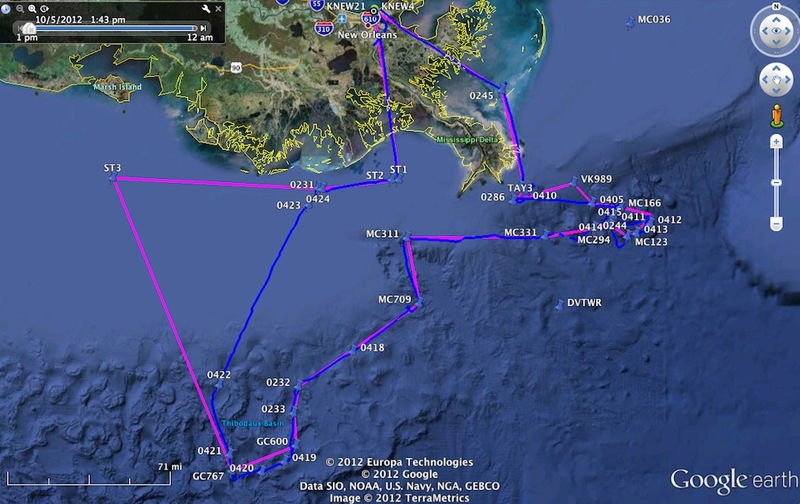 The first is a distant view of the chronic Taylor Energy pollution site, only about 12 miles offshore from Louisiana. (More photos of the Taylor slick can be seen in the article from our Oct 06 flight for whale sharks, and in numerous other of our articles -- just search the keyword on this website). 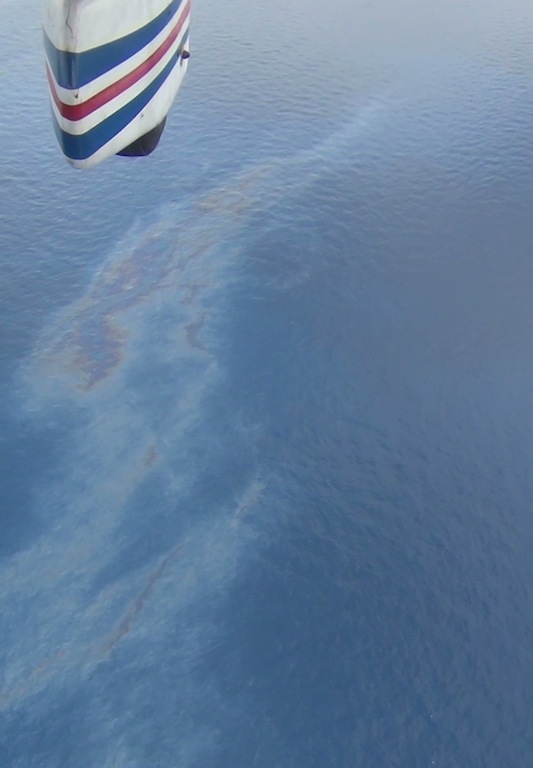 The next eight photos are all of the surface oil in the Macondo area. (The photo filenames will tell you the date, time, and area of each photo.) The next three after that, taken around 1227 CDT, are about 15 nm east of the Macondo. Then, at 1245CDT, we have two more photos of the Macondo area, as we circled back to the west. And one photos taken 3 miles northwest of the Macondo. You can start to see what natural seeps look like, compared to what we were seeing in the Macondo area and eastward! To see more natural seeps, look at the next six photos, those whose filenames say MC294, MC709, GC600, or GC767. Some of these are expansive surface slicks, but we typically do not see the rainbow sheen that we are seeing in the Macondo area, indicating less of a flow. Finally, in the last photo you'll see a platform slick about 20 miles south of Timbalier Bay -- an all too common site around platforms in the Gulf of Mexico. Aircraft & Personnel: Dr. Bonny Schumaker with Dr. Ian MacDonald and Samira of Florida State University, Tallahassee. Seas and weather: Seas 1-3 ft, scattered high clouds, 5-15 kt winds from the northeast-north. Visibility: Air fair, sea good, scattered thunderstorms and low clouds throughout. (Macondo area, ~2 nm northeast of the DWH site) Rainbow sheen here, much heavier than MC166. OIL -- N-S and E-W -- see #0412. Blue/white vessel, large slick W-E. (West end if #0415, 070° to E end at #0416; photos 195-213). Another line of oil south of it. Large thundercloud to the north-northeast of this area, which precluded our getting closer to sites of oil in this area. OIL. West end of slick. (From 20120914, 1514 CDT: Surface oil sheen, ~ 100m wide, ~400m long, SE to NW. OIL. Ground track 170° (magnetic), about 0.5 nm long. OIL. Small group of “pancake” oil patches. No photos, dodging thunderclouds here! OIL. ~ 1.5 nm, E-W. Four sets of lines, all E-W. Just to the north there was a HELIX vessel, with another vessel. Laying cable, or working with a submersible? MODU “Discoverer Americas” and four supply vessels. OIL. Ground track ~240° (magnetic), plus a larger slick further east that extended ~200°. Platform to the northwest with three vessels. OIL. Two parallel lines, each about 0.75 nm long by ~50 m wide, ground track 210°. OIL. Large slick, ~ 3 nm long. OIL. Extending to south of this point, a crescent-shaped slick. OIL. At least four separate lines. Drill ship to the north. Many more isolated lines between here and GC767. OIL - lots. This point is the North end of a 5-7 nm long slick! OIL. This is the south end of another slick running N-S, about 1 nm long, x 50 nm wide (E-W). Slick, W-E, ~ 1 nm long x 500 m wide. HELIX Explorer there, with ROV. Stuff that looks like sediment in this area coming from vicinity of a jackup rig. Drilling mud? Significant slick, ~ 300 m x 50 m, platform at east end of it.